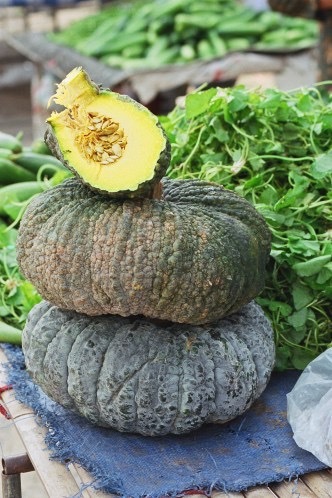 This delicious pumpkin is in season here at the moment and is sold in chunks, by weight at stalls and markets. 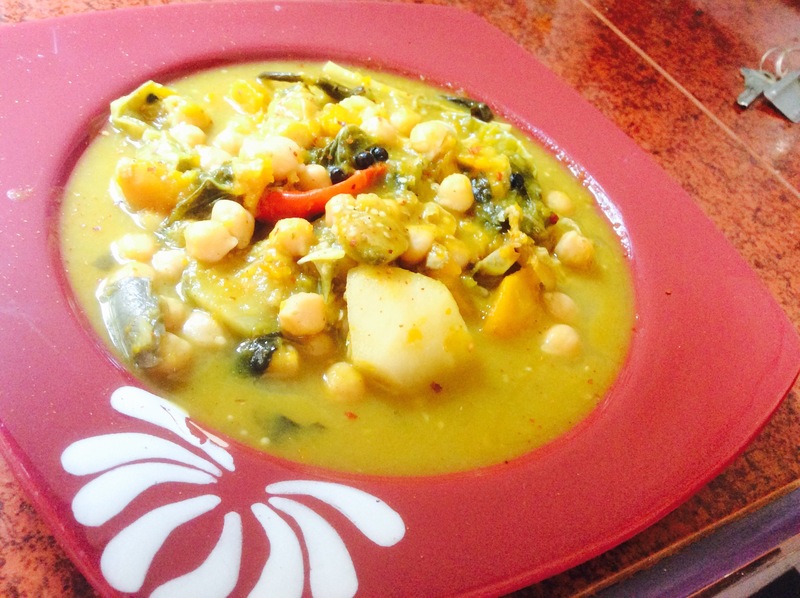 It is so sweet and you can steam it in chunks, add it to stews, bake it or when you cook it right down, it melts so as to make a thick, bright yellow sauce. I love to add it to curries and so today, for lunch, I made a sort of mix and match dish from the bits and pieces in the fridge and around. 1. Using a slow cooker, or a large crock pot, place the chickpeas in the bottom and cover with water. 2. 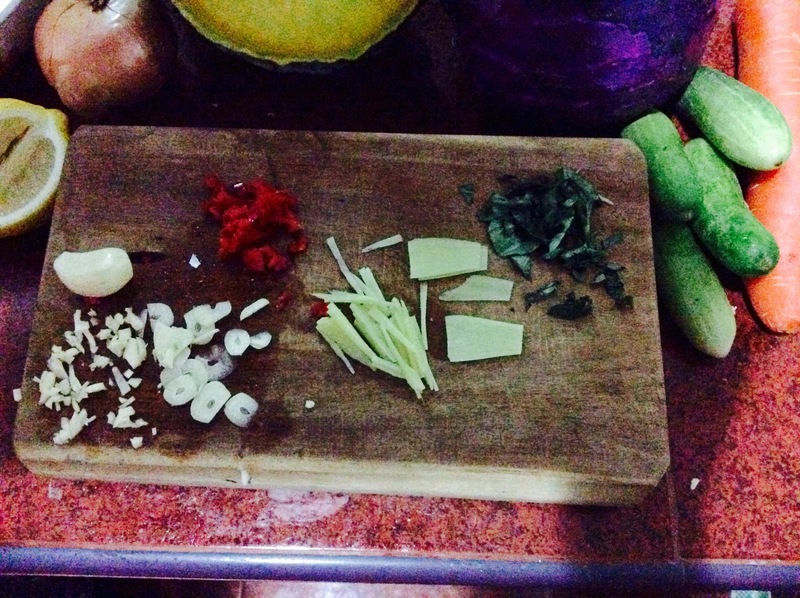 On top of those throw in the garlic, lemongrass, lime leaves, chillies, peppercorns, coriander and galangal. 5. Add the aubergine and potato, then pour in more water just enough to cover everything. Do not stir. Just pop a lid on, bring to the boil and the turn down to a simmer. 6. 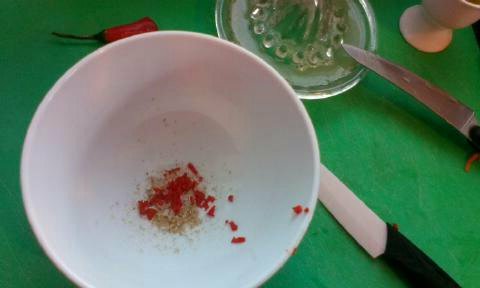 After half an hour, stir three times only. Continue to simmer for up to an hour, or until the squash has broken down. 7. Serve as a warming stew. Be aware that this is a properly sweet dish. 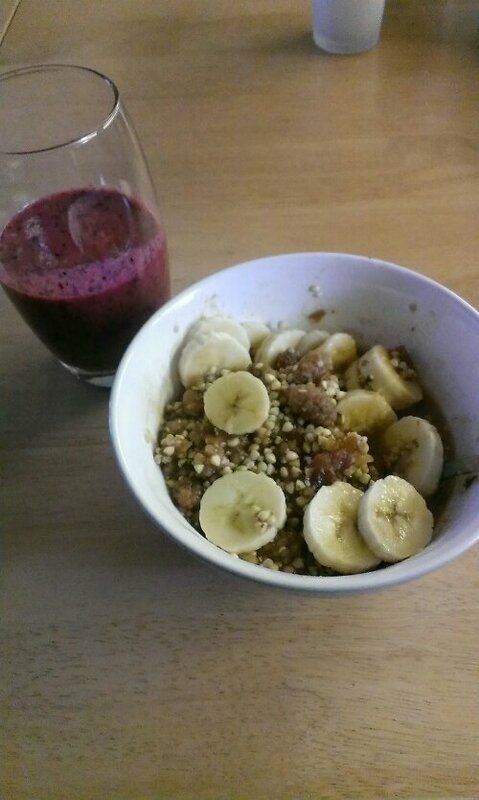 To add more sweetness, if that is something you like, add sultanas and even two bananas about 15 minutes before serving. 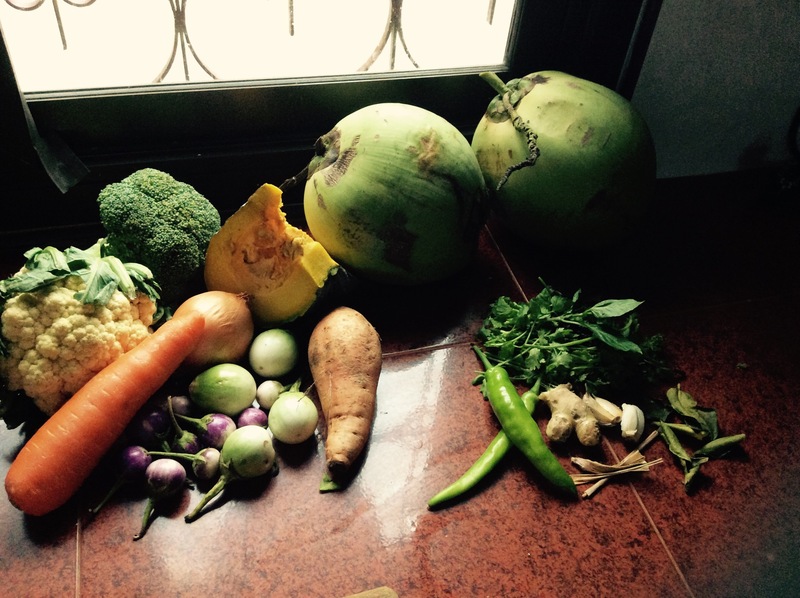 I just had to tell you about how much I love green veg. I always have! 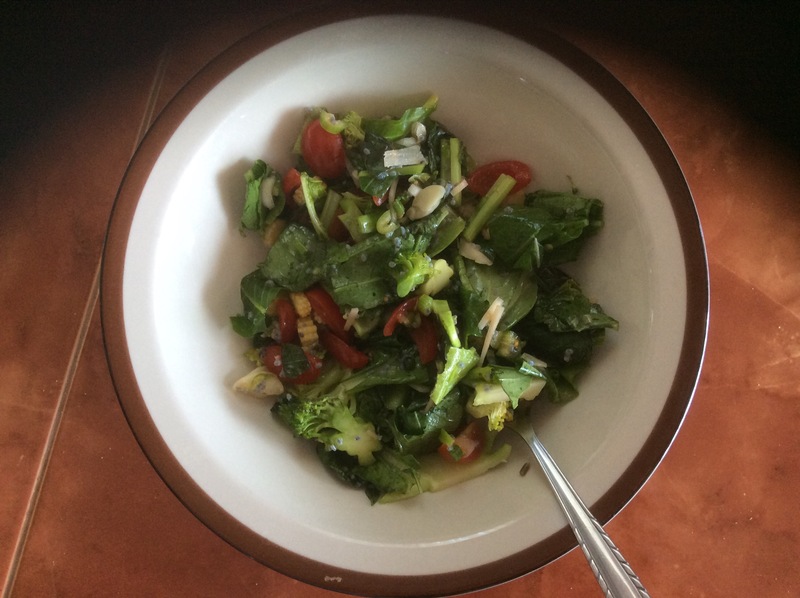 I adore spinach, broccoli, kale and more. I really feel them giving nutrition to my body and they give me a boost! 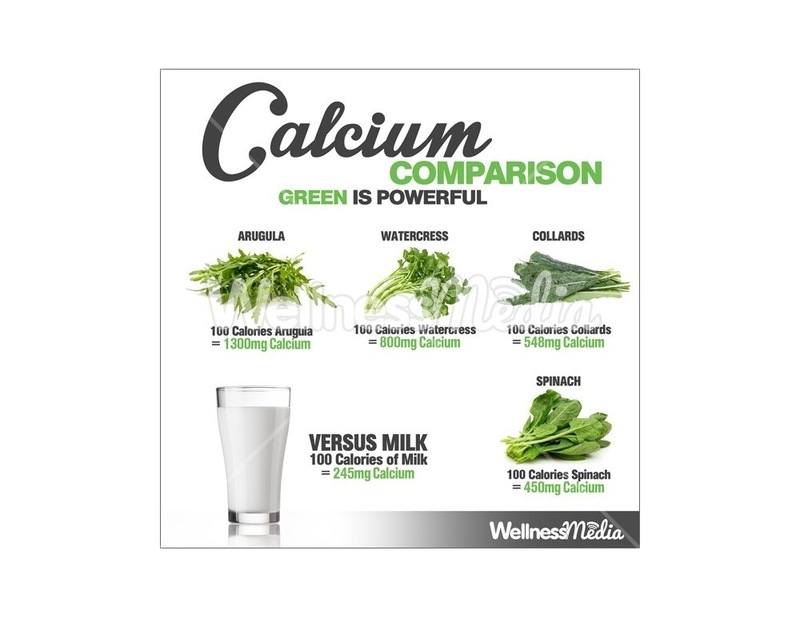 Now I don’t eat dairy, I’m sure a lot of people wonder where I get my calcium from. And this is where. I love that plants give us great quantities of our vitamins and minerals and that we don’t have to rely on using animals. 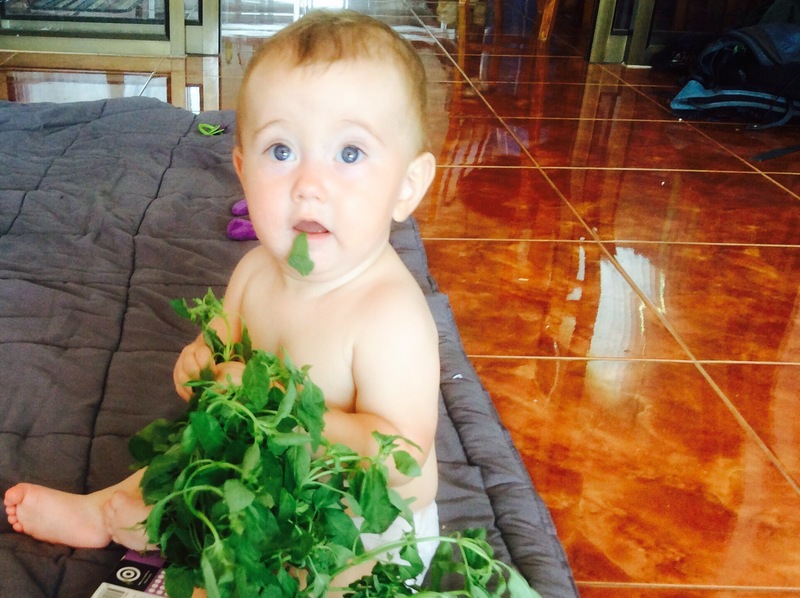 Today on our trip to the market, Bear picked out some wonderful Lemon Basil, so I thought I’d whip up a quick flavoursome salad for us to munch on. 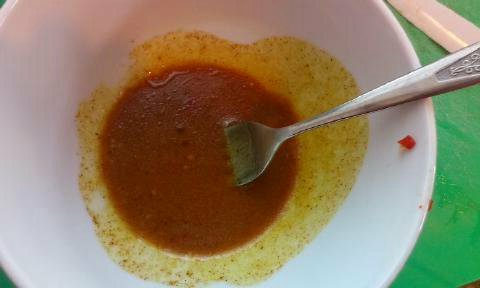 …Combine and pour dressing over. Eat immediately or leave to absorb dressing in fridge! 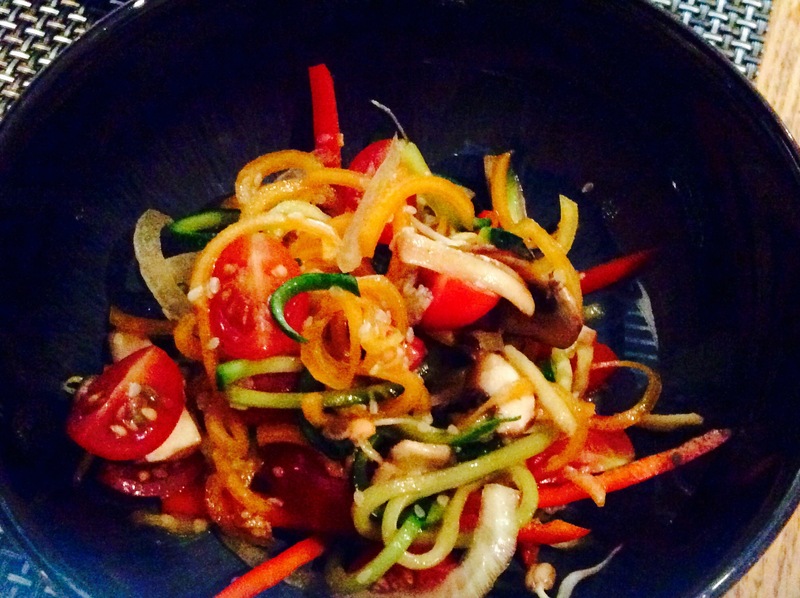 It’s a zingy salad, that you can adapt according to your own tastes. You could replace the herbs with your favourites, swap galangal for ginger, add more vegetables of your choice, maybe celery or cucumber and a sprinkling of seeds or sprouts would give you that added crunch! One of my favourite dishes is Pad Thai and although I love the taste of the traditional, I don’t eat it as much, because egg and fish sauce are in it, although it’s really good without those two ingredients. 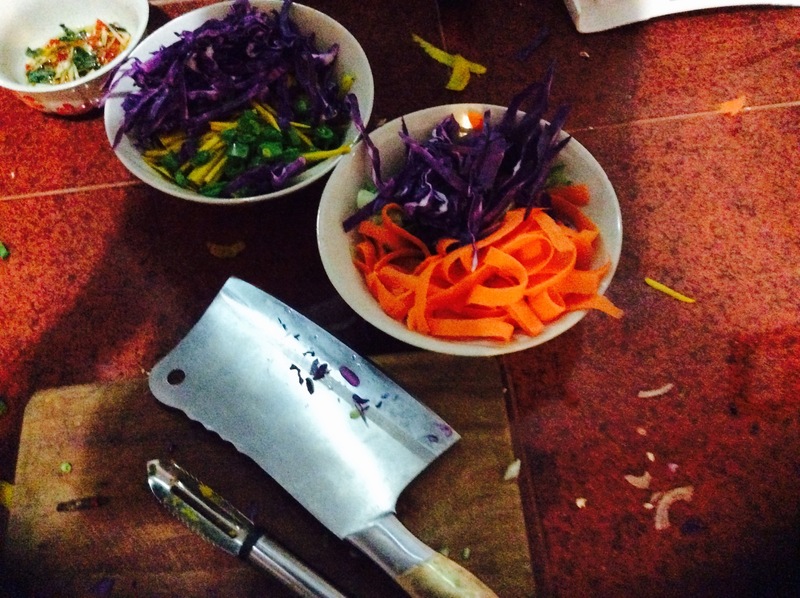 A while ago I made a raw Pad Thai and I wanted to recreate it now that we are in Thailand. This morning Old Town, where we rent a little apartment, was visited by the market. 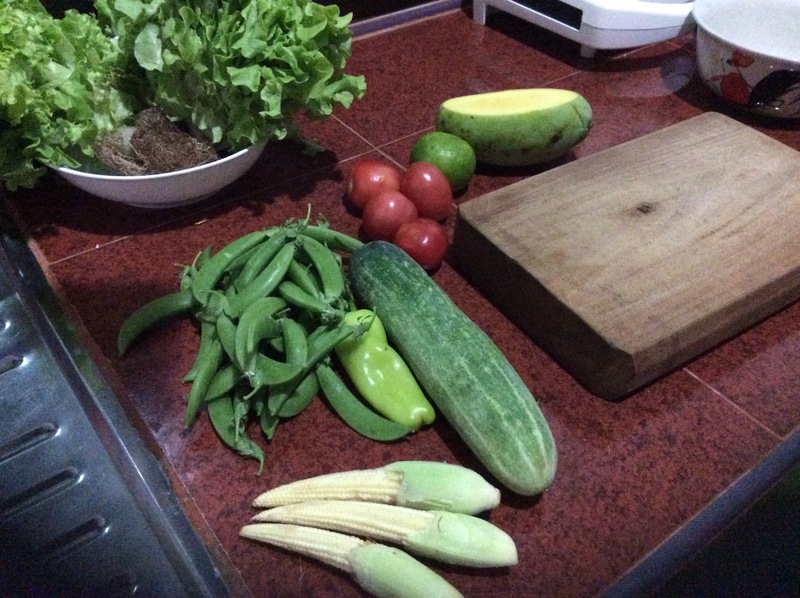 As far as we can tell, aside from the stall vendors at the roadside and in the main town, Saladan, the place to buy the best vegetables, with a huge variety, is the market. Sounds great – there’s a catch. There isn’t a set day or destination for the market. I basically pops up somewhere different on various days, from 6-10am. 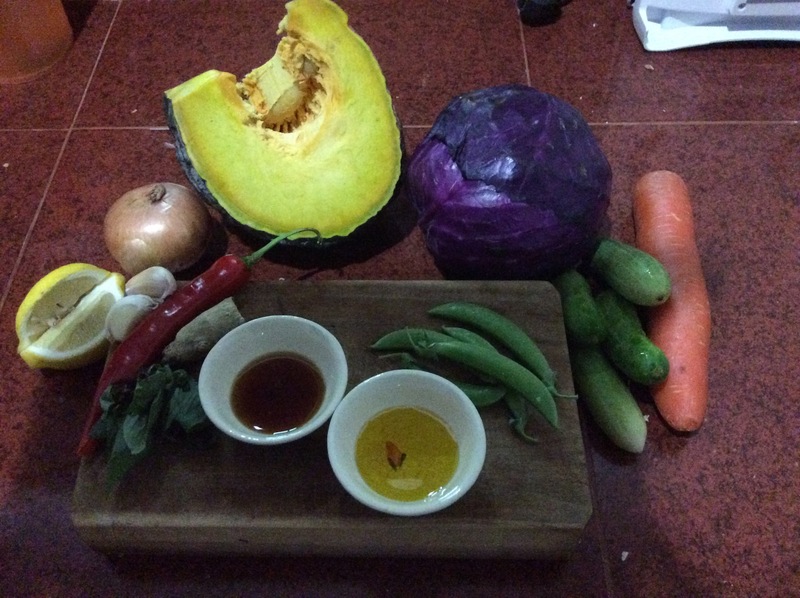 Here are the ingredients I got for my raw take on Pad Thai. I would have liked peppers, mushrooms and cherry tomatoes too, but alas I couldn’t find any. 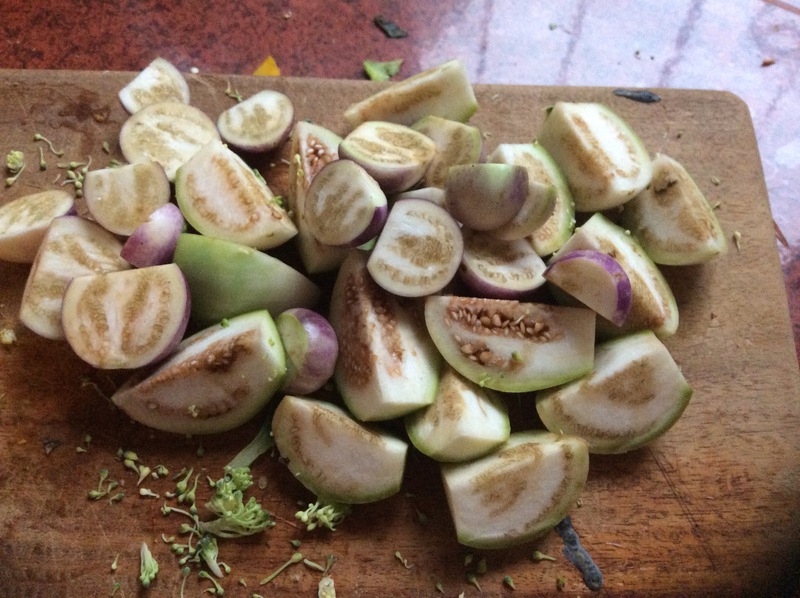 The herb, is aniseed which is used a lot here in curries. 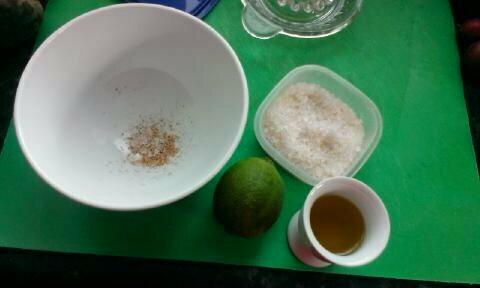 I chopped the garlic, ginger, chilli and the aniseed, then I put them in a tablespoon of oil (I used flaxseed) and soy sauce (couldn’t find raw) and some lemon juice. I left this to one side. 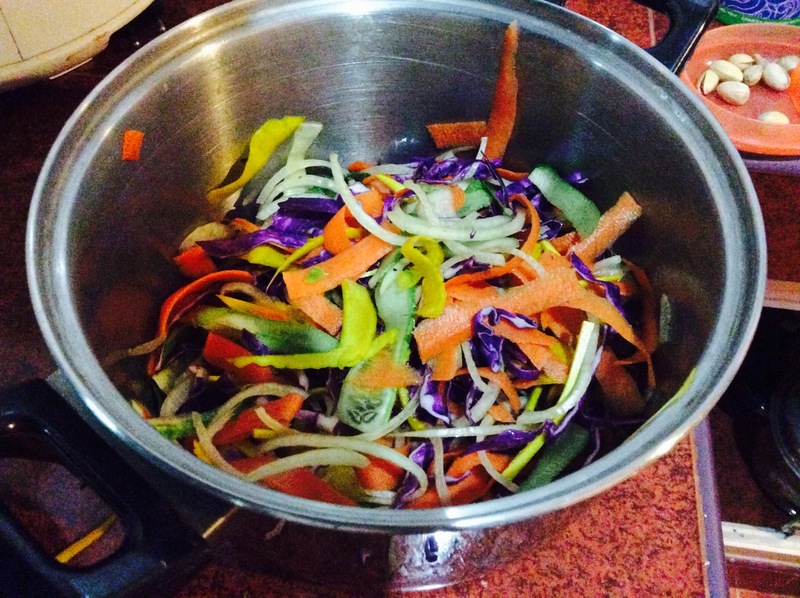 Like I said the other day, I don’t have my spiraliser here, so I used a peeler to create ‘noodles’ and julienned some of the vegetables. 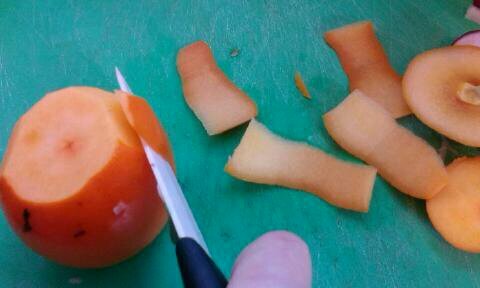 The squash was quite tricky, so I did half and half with that. 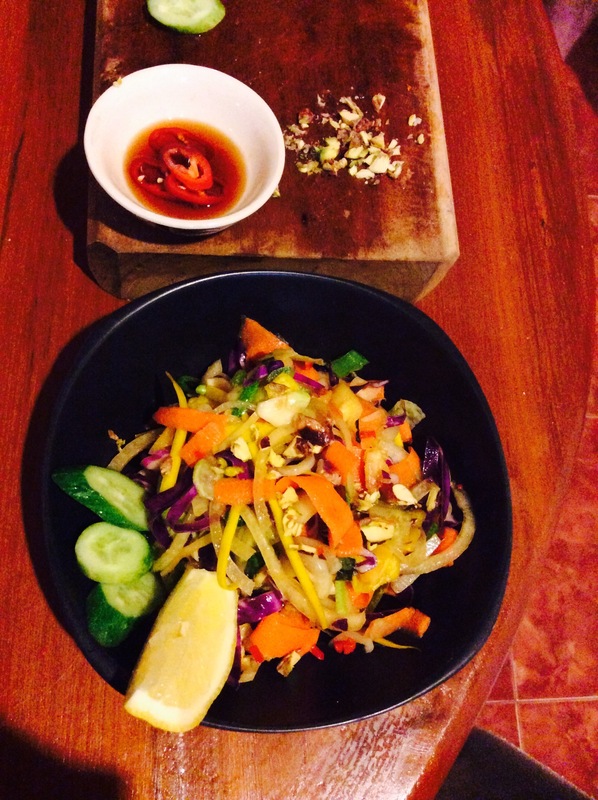 Pad Thai is served with lime, cucumber, crushed peanuts, chilli soy and sugar…I didn’t have all these so I improvised and ours was served with lemon, cucumber, crushed pistachio, chilli soy and pineapple. It was yummy! Except by the end of the dish it got a bit too oniony, so I would use spring onion next time, also we both added more soy sauce to taste! Let me know if you try it! So we popped to a couple of stalls yesterday. There are lots of them here. It seems in the more built up areas that every building is a shop, restaurant or stall. 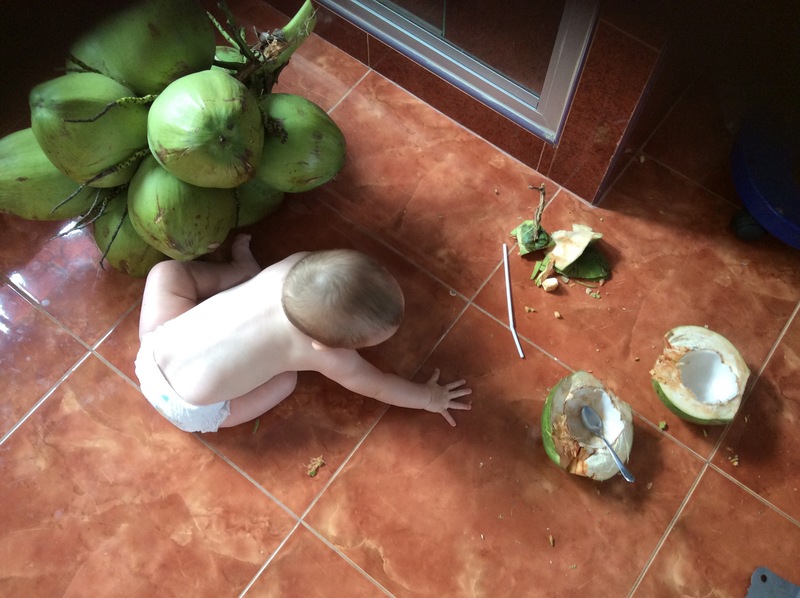 We go there to find ripened coconuts and some fruit and veg. We also have coconut trees growing near our house, but they seem to be smaller and not as sweet. Just as delicious and nutritious though. Bear and I cracked open a couple of the smaller ones today. As you can see from the photos, they are a long way from the shrivelled dry husks we see a lot of in the UK. 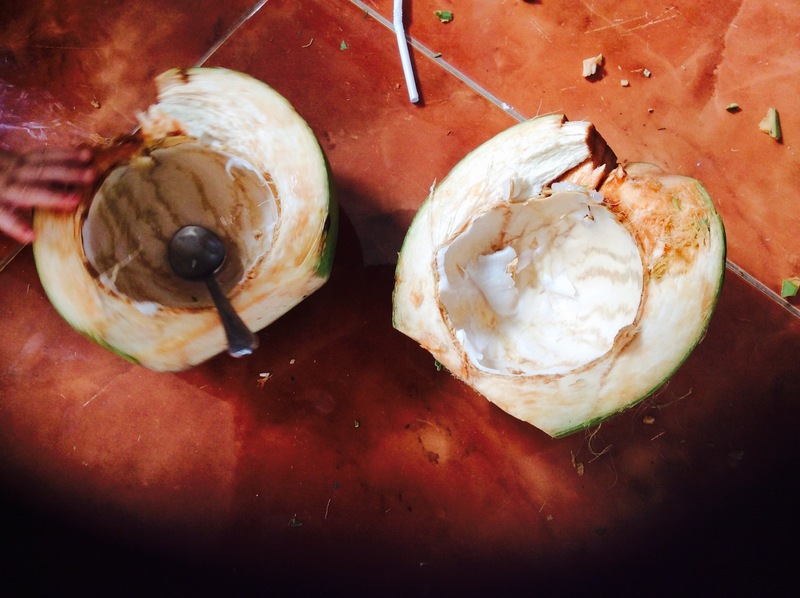 A fresh green coconut is filled with the sweet milky water, then if you split it open, or can fit your spoon in the hole you’ve made, the meat can be scooped out. It’s soft, sometimes jellylike, sometimes tougher. I then made a really simple salad for lunch. It was basic, because I haven’t quite worked out the best sources for my nuts, dried fruits and seeds yet. Once I have, I can add more texture, balance and flavour. 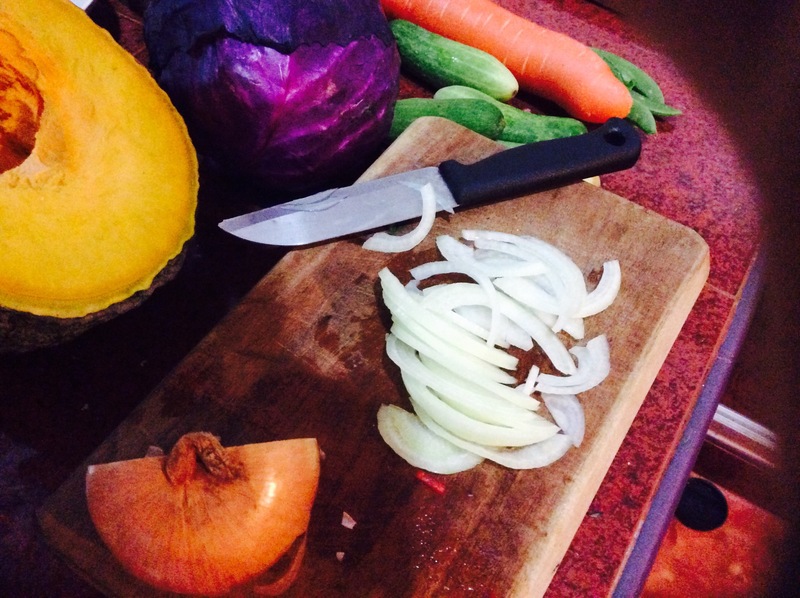 Not that I don’t enjoy the taste of these ingredients alone, I just like to make a dish with depth. 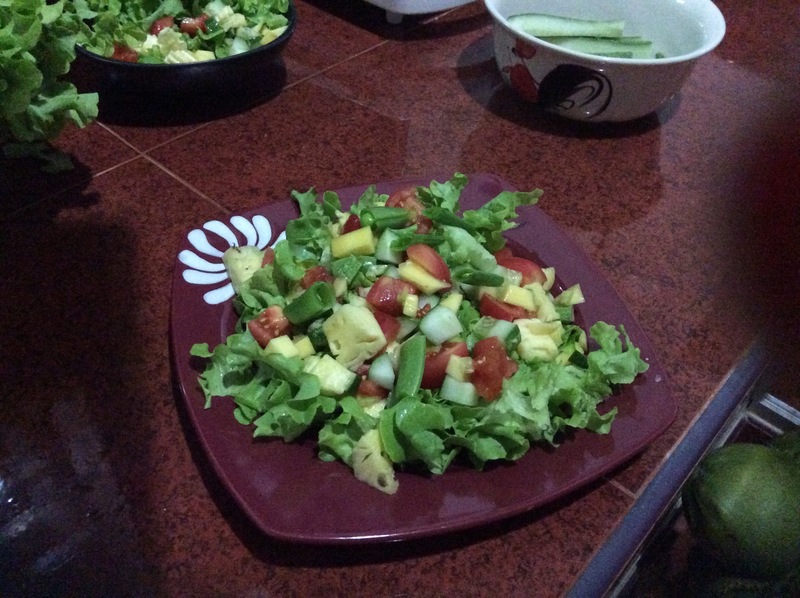 I made a basic salsa dressing with the tomato, mango, chilli and lime juice. I think perfect additions would be garlic, toasted/raw peanuts, dried apricot, a little sesame oil and spring onions. 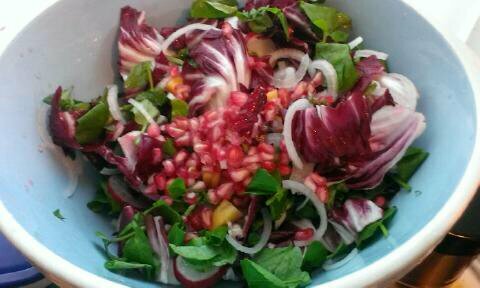 But the beauty of any salad is the adaptive nature of it. Here’s a picture of one I made a few months back. 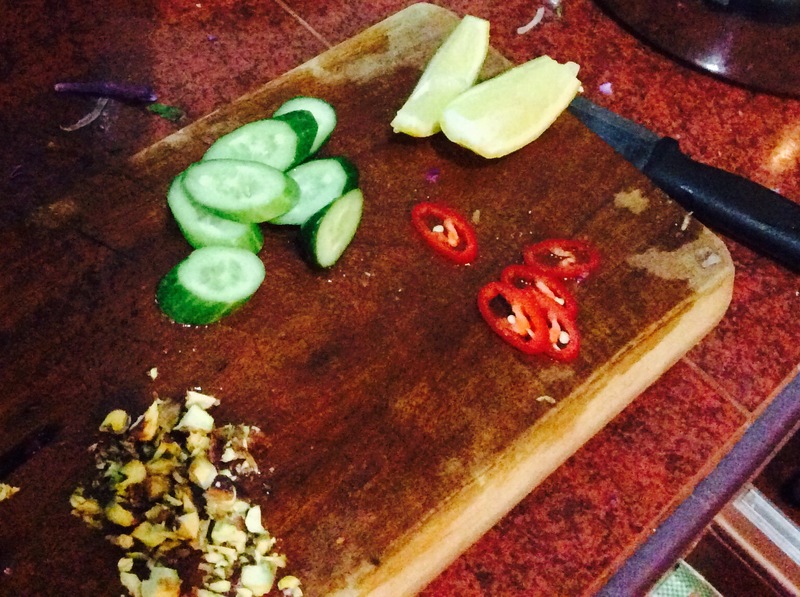 Now I’m here in Thailand, I can try to make a more authentic version…with no gadgets! 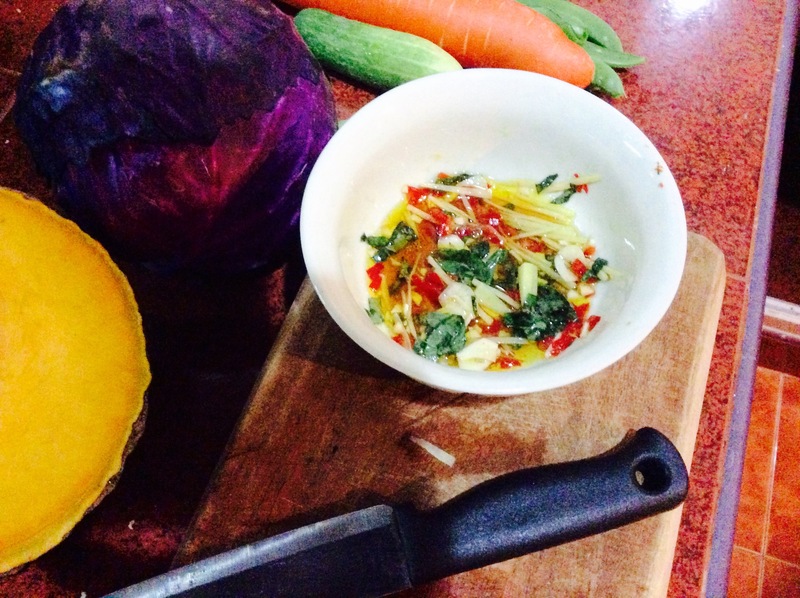 A raw diet is all very well, I hear you say, in the summer, when juicy fruit smoothies quench our thirst and crisp cold salads cool us down – But what about in those chilly winter months. I do see where you are coming from, in fact I am a soup lover in general, especially in the autumn and winter. I love parsnip soup, butternut squash, any kind really and I love summer soups too, fresh pea and a sweetcorn chowder. I’m not going to be too hard on myself. 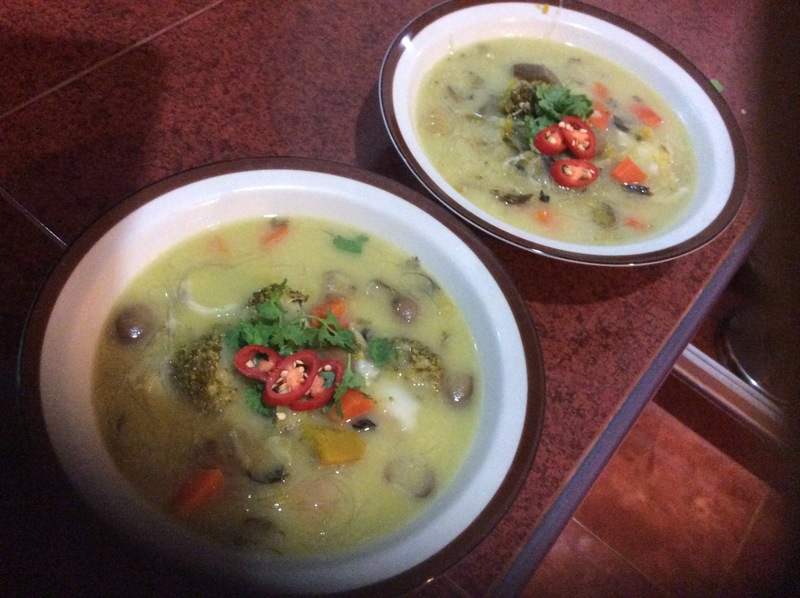 I think that in my life, there is still room for hot soup, although if you want to stick to the raw, soups can be made below that 40 degrees celsius. Those advocating raw believe that foods cooked above this temperature have lost much of their nutritional value and are less healthful or even harmful to the body. The arguement is that raw or living foods have natural enzymes, which are critical in building proteins and rebuilding the body, and that heating these foods destroys the natural enzymes and can leave toxins behind. Of course there are two sides to every story. So I’m going to eat soup cooked to a heat above that if I ever fancy it, but I’m sure going to try out some raw soup too, because there are some fab recipes out there that look delicious. Now, enough of the gumpf (my ‘word’ of the week) and onto a little recipe of my own. 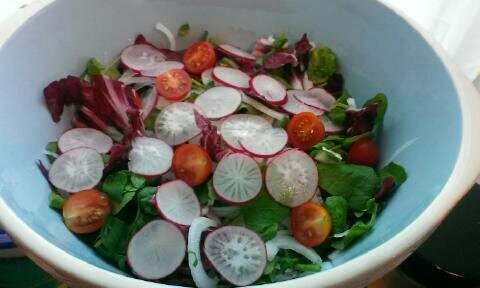 A way to fit a big salad into your wintery day, with added spicy kicks from fresh chilli, peppery radish, warming mustard and winter nutmeg. 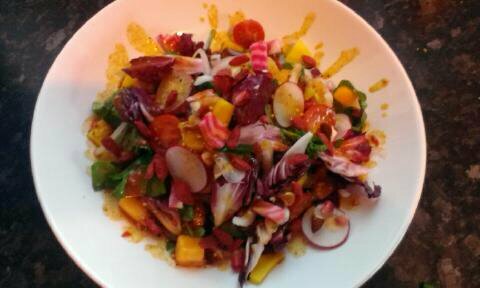 I’m also a firm believer in colour being a real addition to the mood you are in when eating, so when I found some beautiful ‘candy stripe’ and ‘Golden Yellow’ beetroot, I was inspired to make a rainbow salad. I tried to think of the spices and ingredients to compliment each other and of course the nutritional goodness in them. Beetroot is sooo good for you, a great source of Folic acid and a real help with your liver, blood pressure and some heart issues. I love its earthy taste and I was surprised at how different the two taste. 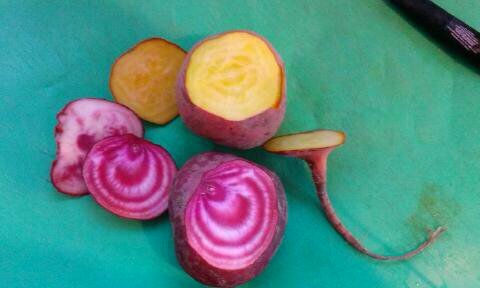 The Candy stripe is mild, with a radish like taste and the golden more earthy like its dark pink counterpart. 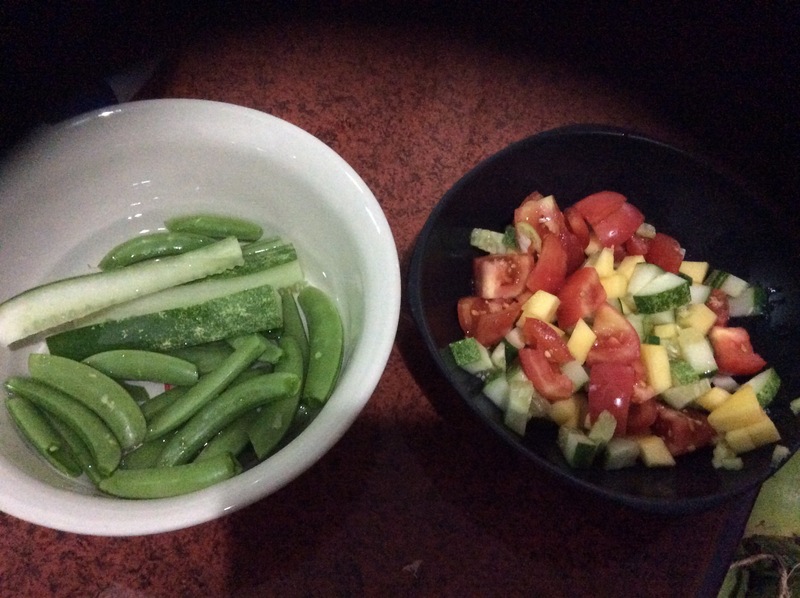 Both really tasty raw and not so messy to prepare =D I also sneaked in my new favourite fruit, the persimmon, which is very high in Vitamin C, Iron and has calcium too. 2. 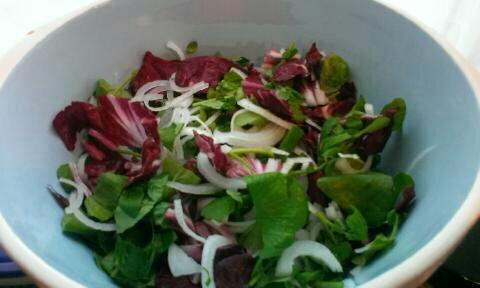 Chop your lettuce and watercress to make a peppery base for your salad. 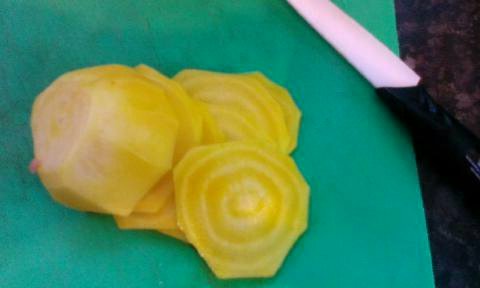 Add very thinly sliced sweet onion for added depth of flavour. 3. Chop and add the radish and the remaining ingredients, stirring after every addition. 4. 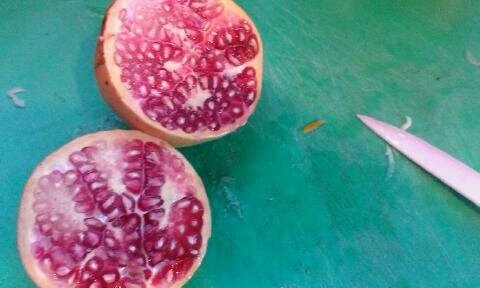 Remove the peel of the persimmon and chop into cubes to add little bursts of sweetness, chop the pomegranate in half and squeeze the seeds into your salad, letting the juice in aswell, more sweetness to compliment your spice. 5. 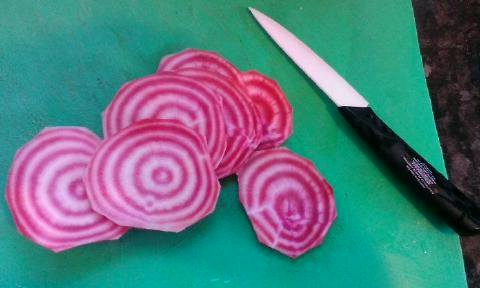 Slice and chop your beautiful beetroot before stirring thoroughly and adding your dressing. Make sure you cover as much of the ingredients as possible. 6. 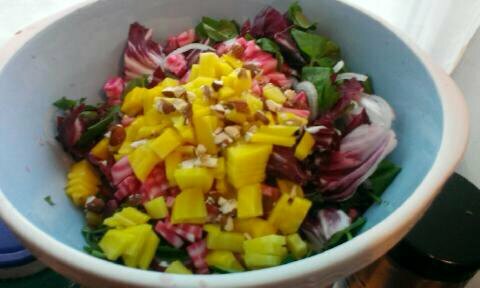 Serve a good helping of the salad and sprinkle on the goji berries and nuts at the last-minute.